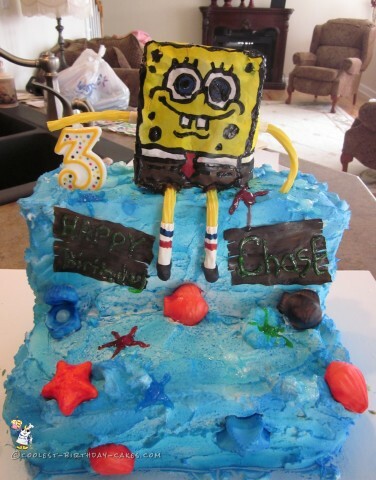 I made this Spongebob Squarepants cake for my son’s 3rd birthday. After having to listened to this song 24/7, my son wanted his 3rd birthday to be all about Spongebob. I made the base of the cake into a square and cut the other square cake into 3 sections by stacking them together to make the backdrop. I covered it with buttercream icing in a swirl method to make it look like the sea. I used fondant in soap molds designed with sea creatures for the starfish and shells.Spongebob was my masterpiece. I cut out a square piece of cake and covered it with fondant. Using my Cricut machine, I cut out a paper design to make the Spongebob face, tie, and outfit. The arms and legs are yellow twizzlers. I put fondant around the base of the legs to make the socks and shoes. For his party, I dressed my son in a shirt and hat made like Spongebob and all of the food was labeled as Spongebob characters like Planktons for the hot dogs.